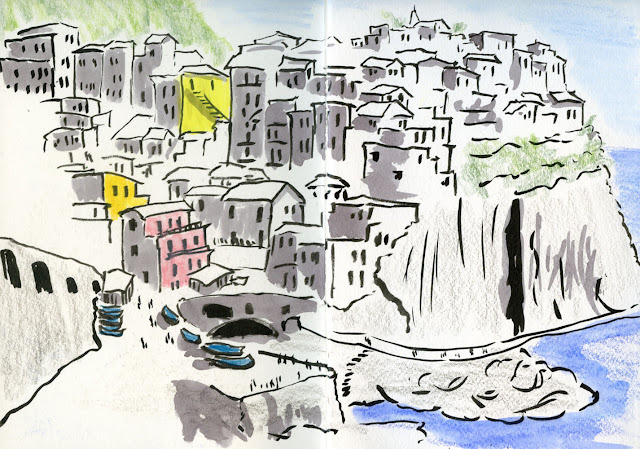 [By Tina Koyama in Italy] Greg and I took our first trip to Europe in 2006 – long before I began sketching – to the country that was at the top of our bucket list: Italy! Since I became a sketcher, we’ve traveled to several other countries, but I have always yearned to visit Italy again. That’s because unless I’ve visited a place with a sketchbook, I feel like I haven’t properly seen it. I finally got my wish – we just got back from three weeks on the Amalfi Coast, in the Cinque Terre, on Lake Como, and in Venice. Here are my favorite sketches from our 18 days. A friend who travels frequently says that her general happiness is directly proportional to the amount of time she spends in Italy, and her favorite place in Italy is the Amalfi Coast. As we explored the vertically built village of Positano, her words rang true for me. Turn your head one way to see the spectacular coastline; turn it the other way to see impossibly compact houses in sunny pastel hues clinging to the cliffside. It all made me happy. Climbing steep hills and stairways, you have to take in the view slowly – if only because you are pausing to catch your breath! 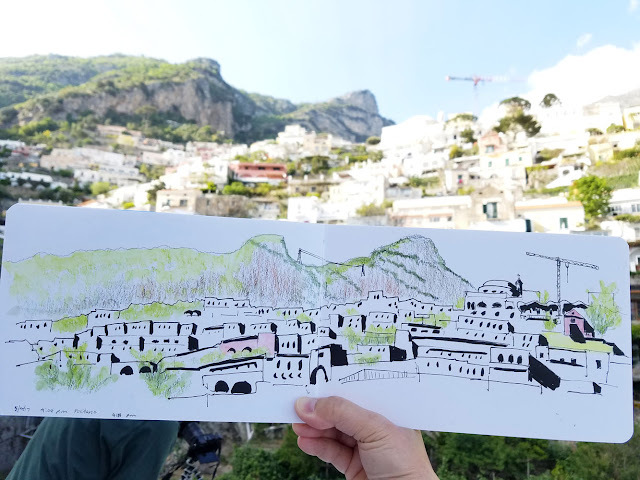 With my very first sketch, I realized I had no previous “vocabulary” for Positano’s (and that of much of southern Italy, it turns out) architecture. The buildings are simple in design, but each is placed on the hillscape however it is best supported, and that often means directly against another structure – and not necessarily at a right angle. Built-in wonkiness! A-ha – finally an architectural style for me! Given the impossibility of working out perspective, I adored sketching Positano’s landscape. Back in 2006, I was making art, but the materials I used then were beads, fabric and other fibers. On first sight of the colorful pink, yellow, blue and coral buildings, I was completely smitten with the Cinque Terre on the Ligurian Sea. I took many photos that I’d hoped to someday express in fiber art. At that time, I was still convinced that I “couldn’t draw,” so I focused on abstract works. While I loved the pastel palette of the region and felt inspired, I never got around to finding a way to express that vibrancy. Afterwards, whenever I saw photos of the Cinque Terre, I felt regret; it was as if I were a writer with the thoughts and ideas but not the words. In Manarola, one of the Cinque Terre’s five villages, there’s a particularly popular spot for postcard photographers and painters, so it’s one of the most-often seen views of the town (and all of the Cinque Terre). I know that some sketchers shy away from iconic views, but I didn’t care that it had already been portrayed many, many times. Sitting at a shady picnic table high above the water, I felt as if I’d waited 11 years to make the sketch shown at the top of the post. Although I’d carried the feelings since 2006, I finally had both the inspiration and the vocabulary to express them. Our next stop was Lake Como and the town of Varenna. Shortly before I left for Italy, I had been introduced to the secondary triad color palette in a colored pencil class I was taking. Italy’s landscape seemed ideal for giving it a try, so I built my colored pencil selection for the trip around the palette. 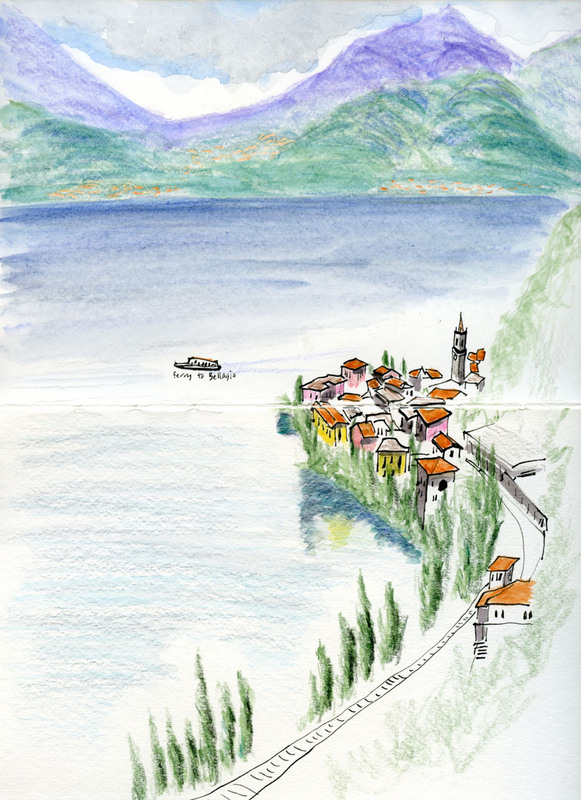 My first morning in Varenna, I knew that the palette had been made for this place: blue-violet mountains, lush green trees and the terracotta rooftops of the surrounding villages. In addition to exploring Varenna thoroughly, we spent time just hanging out in the piazza observing the locals taking la passeggiata (slow evening stroll), catching up with their neighbors. Venice, the glamorous sinking city, was our last stop. On our visit 11 years ago, we had spent too few days trying to see too many museums, so all I remember of it was fighting crowds, being lost and feeling frustrated. 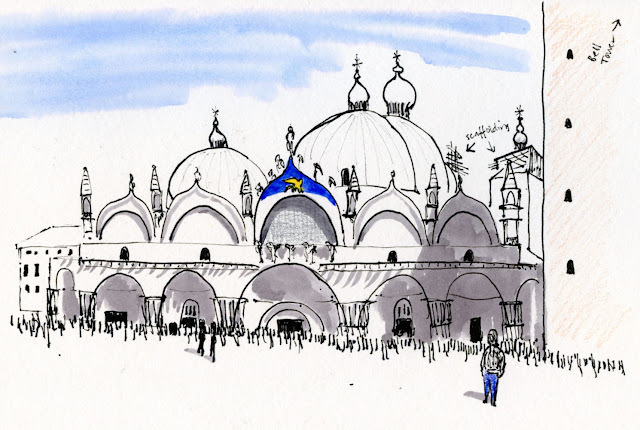 We wanted this year’s visit to be different, and it was – except for San Marco Square, we avoided all high-traffic areas and rented a flat in a quiet neighborhood off the beaten tourist path. 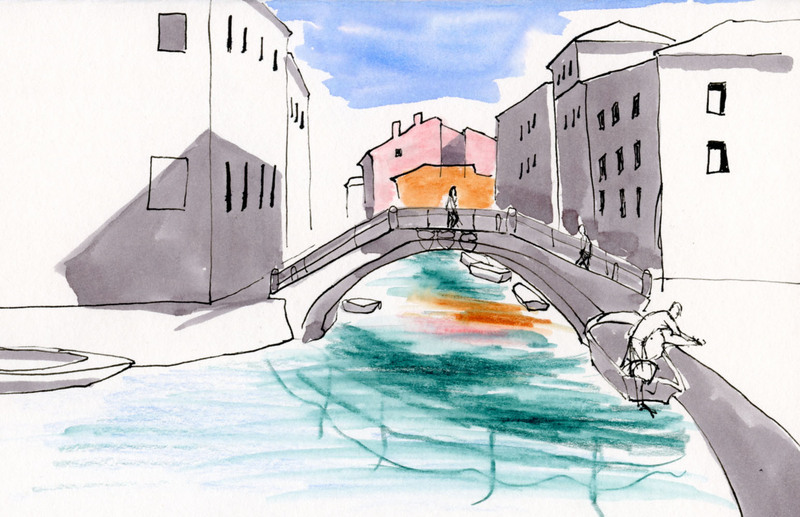 We spent many happy hours sketching and photographing our Dorsoduro neighborhood. 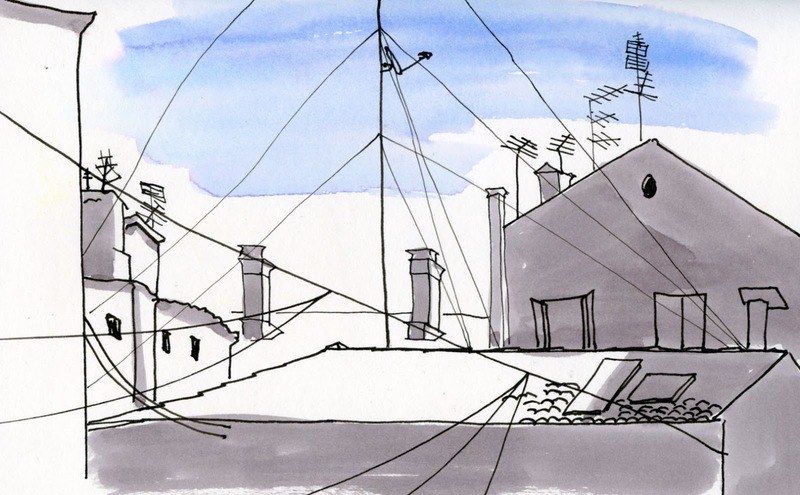 In particular, I enjoyed going around to the back sides of buildings where all the wires and antennae were tucked away from the postcard views. A minor canal was just outside our flat. One of my fondest memories of Venice is sketching the canal traffic in the cool, early-morning air, the sky a brilliant blue, all within sight of our flat (in other words, not far enough away to get lost). 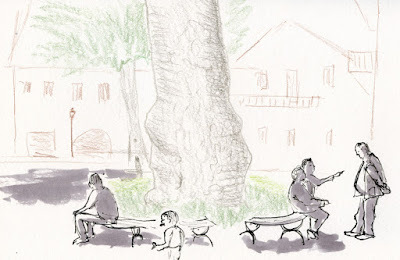 Since I began sketching and traveling, I’ve come to learn that it’s impossible to be both a tourist and a sketcher and expect to do both well. If I visit sights, I feel frustrated that I’m not sketching. 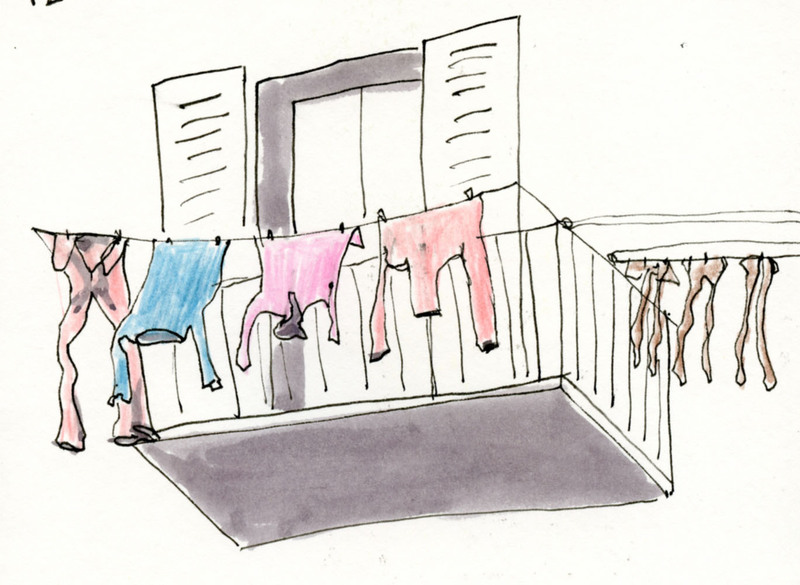 If I take time to sketch, I feel like I’m missing out on the long list of things I “must” see. (Greg is a photographer and feels the same way.) Over the past several years, we’ve figured out what we really want from travel – an opportunity to see and experience unfamiliar places through my sketchbook and his camera – not a checklist of “musts.” I feel no conflict about our choice – when I travel, I’m a sketcher, not a sightseer – but the sights I do see are observed closely, and the memories are preserved well in my sketchbook.